I am a newborn bear kamuy. It is dark and warm in that space, and it is filled with Mother’s smell. I am absorbed in sucking her milk. Then, just as I am about to doze off, I hear a sound from a long way away. It is getting closer. Mother doesn’t move a muscle. Nor does she answer. But suddenly the snow caves in and a small hole opens up in the snow wall. A single beam of light shines straight through the hole, like a pole reaching toward us. The light reaches my mother and I see her face for the first time. It is shining. “Everything’s going to be fine, child. Stay right here.” She rises from my side and walks straight into the light. The furry edges of her massive body sparkle like gold. As Mother stretches to peer through the hole in the wall of snow, I hear a twang. “Oh!” Slowly she spreads out her arms. Then, quite suddenly, she falls heavily onto her back. The wall of snow crumbles and sunlight fills the space. White. It’s blinding white. The space is filled with blinding white light. Red. There’s red. Red is sprouting from my mother’s eyes. It spills and spreads all over the white snow. The dogs are making a furious noise. A huge hand reaches toward me. I smell the smell of humans for the first time. I am an Ainu boy. Father is sitting by the hearth carving wood when his hand goes still. He is listening to something. A smile spreads under his thick beard. Last year we found the entrance to a bear’s den by the root of an enormous tree. It was in the middle of a forest ablaze in autumn reds and yellows. Now, that same forest is certain to be under a blanket of snow. Father brings out his bow and arrows, and begins to dab wolfsbane on the tips of the arrowheads. “This is powerful poison,” he says. “It will quickly kill the largest of bears, before it can even take its next breath. The next morning, the fearsome cold has returned and the world seems to sparkle as though it has been scattered with stardust. Everything is frozen solid. Even the snow in the forest, which I usually sink into up to my waist, has hardened like bone. I could have walked on its surface for miles without sinking into it. “We’re going to the mountain to welcome the Kimun Kamuy, the mountain god,” Father says. He means there’s going to be a hunt! “No, no. Tonight we’ll spend the night in the mountains. A boy like you, not even big enough to catch a rabbit, would just get in the way.” Father fastens on his snowshoes and takes hold of his walking stick. Slinging his bow and arrows across his back, he turns toward the mountain, his face aglow. The dogs follow, leaping and hopping in excitement. I watch as the men enter the woods, their breath making white puffs in the air. Stamping my feet to keep them warm, I watch until I can no longer see them. Father does not return home that day. Or the next day, or the next. Outside I can see the triple stars glittering high above in the frozen night sky. I know that the stars are the hearth fires of heaven. I wonder if Father is looking up at them like I am. “I hope he’s all right,” I murmur. Mother sits by the hearth, rocking the baby’s cradle. “Of course he’s all right. The fire kamuy is watching over him,” she says in her musical voice. In the hearth the burning wood makes popping noises and the flame swells upwards. Suddenly the howling of dogs rises from the far distance. I dash outside, and I see Father and the men walking toward the village on the moonlit path. The fruit of their hunt is slung over their shoulders. There are humps on their backs as big as hills. It makes them look like a troop of magnificent bears marching down to earth from heaven. “Look what Kimun Kamuy has seen fit to give us,” Father says. Reverently he sets down a huge bundle of meat and a bear skin larger than any I’ve ever see before. Then he opens up the front of his shirt and draws out a small animal. “It’s a bear cub!” I shout. But Mother reaches for the cub before I can. “Oh you sweet little thing. You must be so cold. You must be so frightened.” She takes the bear cub firmly in her arms and lets it suckle at her breast. “It’s still a baby,” I say. I am a little scared, but I peer at the bear cub. I smell the smell of bear for the first time. Iyomante~Meguru inochi no okurimono (Iyomante, the gift of the cycle of life) is illustrated by Toshiya Kobayashi, a prolific and award-winning artist better known for his series of books (numbering over 15) illustrating the fantastical tales of Kenji Miyazawa, the nearly legendary storyteller and social activist of the early 1900s. In Iyomante, Kobayashi's illustrations provide a window into the daily life and rituals of the Ainu people beyond what is directly mentioned in author Michico Ryo's text. The illustration I posted in the previous blog pictures a mustache-like tattoo around the mother's mouth, though this custom is not mentioned in the text. The tattooing process began when the girl was twelve or thirteen, and was usually completed by the time she was fifteen or sixteen, at which point she was considered eligible for marriage. Notice the earrings and choker she wears. 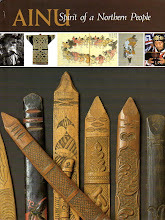 There are carefully preserved samples of these adornments in Ainu museums. The illustration I posted today shows village elders gathered around a fireplace, preparing for the bear-sending ceremony by offering droplets of wine to the hearth fire god from ornately carved prayer sticks dipped into lacquered bowls of wine. You can see how the elders are dressed for the occasion, particularly the headgear woven from straw. They are surrounded by the food and decorated willow sticks that have been made ready as gifts for the bear to take back with him to the land of the gods. The window at the top of the illustration is the "sacred window," always located on the eastern side of a dwelling, and through which the gods were thought to enter and leave the home. I could go on and on explaining what is represented in this illustration alone! The thought and research that went into each illustration in this storybook boggles the mind. I am almost finished with the rough draft translation of Iyomante~Meguru inochi no okurimono, which, as I blogged previously, has been approved by the Ainu Foundation for a publishing grant. Completing the rough (first) draft is always an important milestone. It will take many many more re-writes before I even show the manuscript to my team members, and more re-writes will be needed after I receive their feedback. But the road to this first milestone always feels the hardest part of the journey. This particular book is about the controversial subject of Iyomante, the "bear-sending" ceremony, arguably the most sacred of Ainu ceremonies. 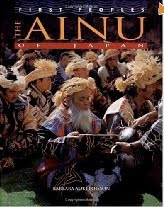 It has often been regarded by non-Ainu as a barbaric practice and was eventually outlawed by the Japanese government. The Bear Festival as practiced in modern times no longer includes the ritual killing of a bear cub. 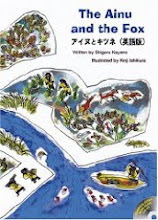 This storybook, however, deals with the subject from a traditional Ainu perspective. 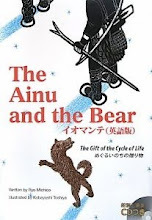 It is quite sensitively done, giving us a glimpse into the Ainu world view through the eyes of a young Ainu boy and the bear cub he helps to raise, a cub which is destined to be "sent" in the next Iyomante. There are a number of tricky spots in this book when it comes to translating with English-speaking young readers in mind, even apart from the potentially upsetting scene of the bear being killed. One is the reference (with illustration) to the boy's mother nursing the orphaned bear cub at her own breast. Until it was old enough to be "sent," the infant bear chosen for the Iyomante lived in the Ainu community as an honored guest, or beloved family member. This extended even to being nursed by Ainu women until it was old enough to be weaned. The illustration posted here shows such a scene. I only hope western readers will accept it in its context and not be offended. 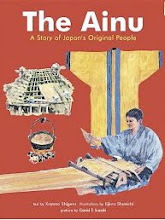 In my next blog I hope to comment further on how much you can learn about Ainu culture just from the illustrations in the book.